Sometimes the usual fare of dining options offered by some restaurants around the Metro can be quite boring. Thus, the appearance of night food bazaars become a welcome surprise for even the finest epicureans, because these bazaars cater to different cravings and appetites. Foodies around Fairview in Quezon City will be happy to know that such one-of-a-kind night food bazaar is coming their way. 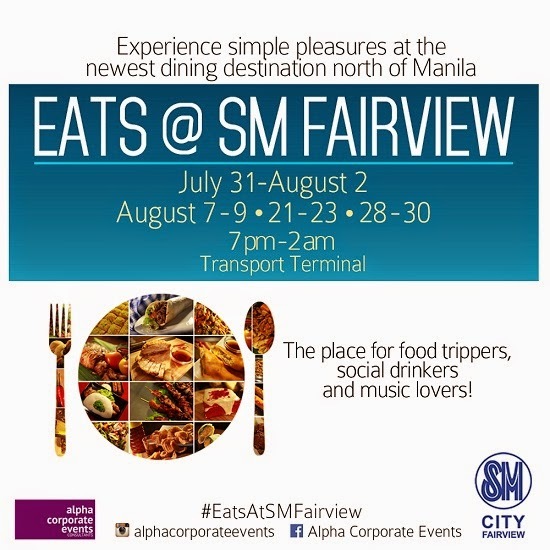 Starting on Thursday night, July 31, SM Fairview will serve as a dining destination of the area where casual food trippers can indulge as they taste samples from some forty different food vendors and kitchens. Dubbed as EATS @ SM FAIRVIEW, the food bazaar will offer favorite local specialties such as crispy pata, bagnet and dampa-style grilled seafood. International selections include American rib eye steaks, authentic Japanese takoyaki and Chinese noodle soups. Those with smaller appetites can snack on freshly-made shawarmas, Ilocos empanadas, and Cebu chicaharon. Delectable desserts like buko sorbetes, puto bumbong, assorted cakes and pastries also await those with a sweet tooth. Acoustic music and DJs will provide the entertainment for foodies as they feast. Spacious dining areas can accommodate small to large parties of families and friends. Drinks are available for those who just wish to chill out at the end of a long week. So meet and eat this weekend and experience for yourself why night food bazaars are somewhat of a cult following around the Metro. Try something out of the ordinary this weekend at EATS @ SM Fairview and go home happy! Open on Thursdays to Saturdays from 7 p.m. to 2 a.m., EATS @ SM Fairview dining adventure will begin on July 31-August 2 and will run until October 23-25 at the Transport Terminal of SM Fairview, Quezon City. For food bazaar vendors who are interested in joining, please contact Alpha Corporate Events at 09178862872 or at alphacorporatevents@gmail.com.